Following a birthday that was memorable for all the wrong reasons, a trip to the emergency vet when Beau suffered bloat, I devised the poster together with the help of a fellow lister on my golden retriever group, which of course was approved by vets. It is copyright-free and you are welcome to email it, print it and distribute it to get the message across. 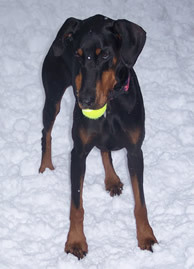 When our other dobermann, Roxy, bloated in 2011 I referred to my own poster on the fridge door to check the symptoms before rushing her to the vet. She survived too, but sadly we lost her to DCM later in the year. The bloat awareness campaign has gone from strength to strength since its inception in November 2008, but we still need everyone to share the information so that more dogs' lives will be saved. You can start reading our story here. CONTACT YOUR VET IMMEDIATELY. Bloat is a true emergency - be prepared to drive to the surgery straightaway. The chance of survival decreases alarmingly if you delay getting the dog to the surgery more than 60-90 minutes after the first signs.